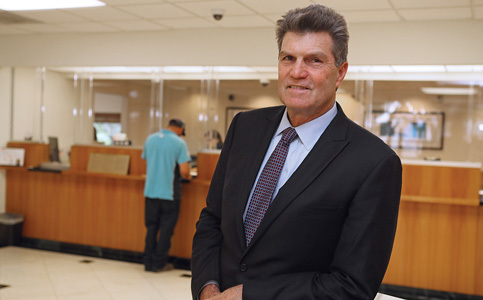 Since becoming president and CEO, Lloyd DeVaux has led Sunstate Bank to significant growth, punctuated by the August acquisition of Intercontinental Bankshares LLC, a move that increased the almost 20-year-old community bank’s assets to more than $400 million, with $325 million in deposits and $240 million in loans across three South Florida branches. In four years, Mr. DeVaux – named “Banker of the Year” last month by the Florida Bankers Association, of which he is the incoming chairman – has more than doubled Sunstate’s equity, from $165 million in assets to its current size. Future market expansion could be on the horizon, according to Mr. DeVaux, whose 30-year career in the financial sector includes prior leadership roles at Union Planters Bank, BankAtlantic Bancorp and City National Bank. Mr. DeVaux sat down with Miami Today reporter Jesse Scheckner. The interview, recorded by Jahmoukie Dayle, can be found Friday at http://bit.ly/2uNHy0Q.